‘Women’s work’ – a phrase that makes us cringe. Embroidery is one of the art forms that can be preconceived as a faction of ‘women’s duties’, believed to be feminine, traditional and light – ugh. In a new series called “A Woman’s Work is Never Done”, artist Eliza Bennett is using her own hand as a canvas to embroider on, to challenge the societal norms of what can be wrongfully seen as an easy, ‘female’ job. 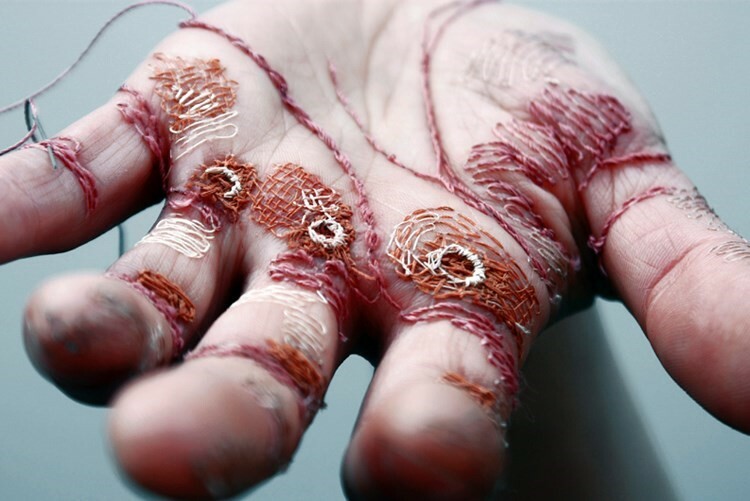 Using a sewing needle and coloured thread, Bennett embroiders on her palms to create the illusion of callouses. In the video of her project, you can see her in action, if you're physically able to look (some of us aren’t, ouch).